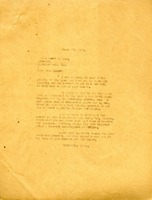 Martha Berry is writing to Mrs. Robert Bacon to express The Berry Schools' sympathy towards the loss of Mrs. Marquand. She also regrets not being in New York. 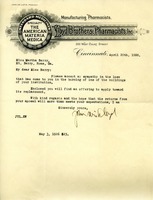 Letter that Martha Berry wrote to Clayton to thank him for his sympathy letter in response to her mother's death. This is a letter from W.A. Dobson to Martha Berry. He is thanking her for the flowers that she sent to him upon the death of his brother, Henry. Sympathy letter written to Miss Berry in regard to one of the school buildings being burned down. A letter from Elinor Merrill to Miss Berry expressing her sympathy for the loss of the school dormitory, along with a $5.00 donation.